Cryolipolysis (Fat Freezing) is the next Best alternative to surgical liposuction. No surgery, safe, no downtime, pain free, and affordable. Cryolipolysis is non invasive, permanent fat reduction procedure. Discovered by Scientists at Harvard Medical. Clinical studies have shown Cryo liposuction treatment to be effective on average between 20%-45% of the fat cells in the treatment area in just one session. It is FDA approved safe (Food & Drug Association) in America. Cryolipolysis is a non-invasive procedure. It uses cooling technology that results in localised fat reduction. Fat cells are more responsive to the effects of cold. Fat cells crystallise at different temperatures to other cells like skin, tissue, muscle mass, and nerve fibers which remain unharmed. Until recently, cold therapy or cryotherapy has been used for therapeutic effect helping to reduce pain, swelling and inflammation. Now freezing fat is one of the most significant advances in the field of non-surgical fat reduction.Initially, cryotherapy was only available to the medical profession. Cryolipolysis will involve the ice cold treatment being applied to the specified tissue area (not directly on skin, and also painless) which then triggers apoptosis. This is the name of the process in which fat cells breakdown and crystallise. After this process, the fat cells will then die and will be disposed naturally of by the lymphatic system. The cell breakdown is a gradual procedure and can take up to four weeks to be visible. Individual results will depend on the thickness of subcutaneous tissue. What Areas Of The Body Can Cryolipolysis Be Used On? PLEASE NOTE- EACH AREA IS ONE TREATMENT- E.G UPPER ABDOMEN WOULD REQUIRE ONE VOUCHER. 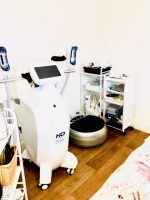 Cryolipolysis is a very effective treatment and will remove stubborn fat that refuses to go away no matter how hard you exercise or how well you eat. Your diet and exercise regime has a massive impact on the reduction of fat within the body. To achieve maximum results, clients should follow a good exercise plan and a healthy and balanced diet. .
TO BUY THIS DEAL:- To purchase this deal, press the BUY NOW button under the picture to go through and pay, you will be emailed a voucher instantly with the booking line number for Bia Beauty. On the rare occasion you cannot book a convenient date or time or if your are not suitable for the treatment for medical reasons, we would refund your payment in full. Must be Aged 18 & Over. Any area of your choice including Tummy, Love Handles, Thighs, Bingo Wings & More. 1 Voucher Per Person, although multiples can be bought as gifts. Over 18's only | MUST CALL TO BOOK IN ADVANCE. 24 Hour Cancellation Policy. Tue - Wed: 10am - 6pm \ ​​Thur - Fri: 10am - 8pm \ Saturday: 10am - 4pm. Subject to availability.